I decided to do a little cleaning today. Maybe I should’ve been studying, but this is still progress. And, any progress for me is good progress. 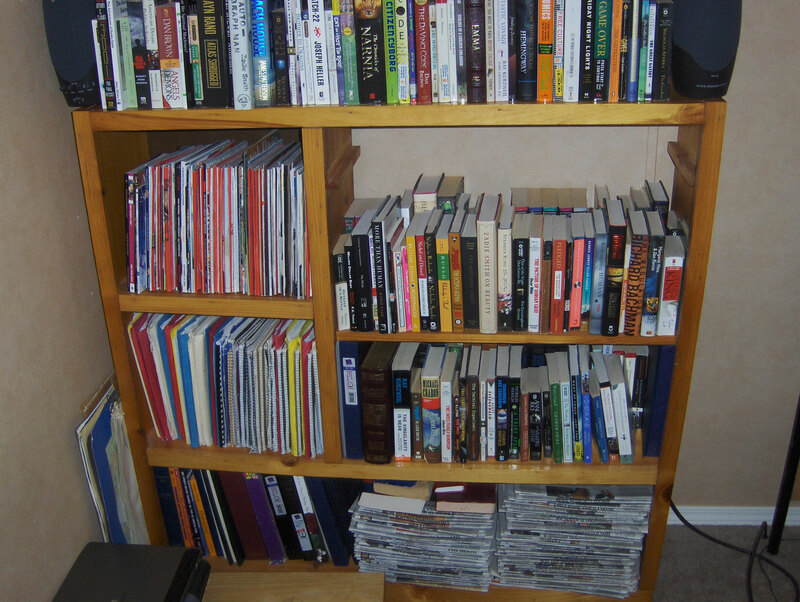 For the most part, I only reorganized my bookshelf, as you can see here. I’ve actually had my books alphabetized for at least two months, maybe longer. My sister and I did it when she had stopped by one weekend, and they’ve been stacked in the living room floor since then. I organized by title as opposed to author’s name just because that’s the way I like to do it. I more easily remember titles than names for some reason. This bookshelf represents a large part of my life for the last five years. Not only does it have my book collection, it has a lot of written work, schoolwork in some folders, magazines I’ve read (I wouldn’t be able to fit even half my magazine collection on the shelf). So yes, I’m a packrat. I have trouble letting go of things. I do believe it’s an obsession. Not sure if it’s a psychological disorder or not. I’m sure it’s listed in at least one psychology book. Some of it might come in handy one day though. I won’t even show you my DVD collection. It spans four 180-DVD shelves. Two of them hold movies, the other two TV series. I only have about three empty shelves left to fill on those. Most of my book collection has been put together over the last few years. I had very few books before starting college. They represent this part of my life for more than just mementos. They are the things that I’ve learned. Many of the books are fiction. Some nonfiction. I think I’ve carried away something from each book that I’ve read. Some more than others. Some have changed my life in profound ways. Some have opened my eyes to other cultures. Other viewpoints. Contradicted ideas that I held for so long. When I say changed my life in profound ways, I’m not just saying that because that’s something someone might say. I wouldn’t be the person I am today without the works I’ve read. We really are on a journey with the writer who is trying to understand the world around. I’ve been on some wonderous journeys. A few that I wish I wouldn’t have taken, but that’s rare. Five years of this has changed my life. Have any books that have changed your life? I would love to read them. I won’t bother listing all of mine. Each has its own little place, resting inside me, forever making my mind wander to those places, allowing me to think about the world in a different light.